Mini Kava Kit: 1/2 lb. Kava, Strainer Bag, Coconut Cup. All you need for a real kava experience. 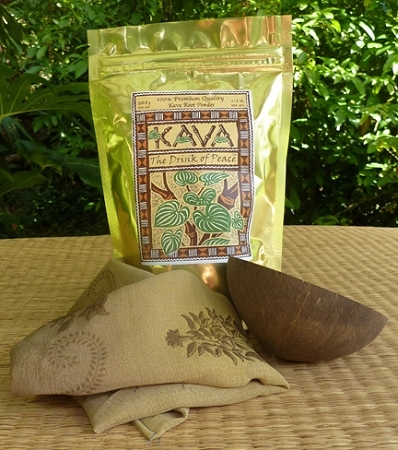 Includes 1/2 pound of our Premium Quality Vanuatu Kava powder, one strainer bag, and one coconut cup. A great deal at $32.95. Separately these items would cost $35.95. A savings of $3.00. This is my first experience with powdered kava. I have tried extract pills before, but they did very little. I ordered the mini kit as my first purchase from this site. It was shipped very quickly and arrive on time. I made my first bowl of kava the traditional way. This experience is fantastic. I feel happy and relaxed. I will definitely be purchasing again. The service was terrific. I even had a hand written aloha on my invoice. I can't express how positive my experience has been. Thank you. fast and friendly service, great product! coconut shell was slightly damaged so they sent a second one with it along with the nice hand written aloha. email with questions, fast and friendly responses. this is my first experience with kava and am enjoying it so much that i had to write this after drinking it. Just got my order today! Very excited and happy with the product! Thanks! Hallo! Ich habe mir das Minikavakit bestellt, welches nach 4 Wochen auch eintraf. Ich kann Kava nur empfehlen, besonders wenn man unter Ängsten oder Panik leidet. Die Wirkung ist dem Tavor oder Valium ähnlich. Alles in allem nur zu empfehlen. Und das Paket kommt sicher an.